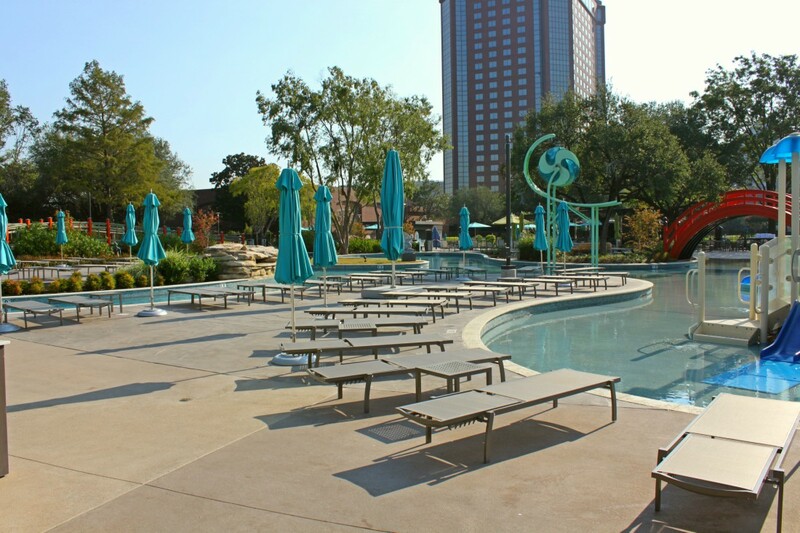 The Hilton Anatole Hotel is a landmark that spans 45 lush acres in the Dallas Design District just north of downtown. The hotel was constructed in 1979. The hotel has over 1600 guest rooms, ballrooms, five dining venues, a spa and health club, outdoor pool and 7-acre private Sculpture Garden. The hotel is host to many events, conferences, and conventions. In 2015, Hilton broke ground on Jade Waters, a $20 million seasonal resort pool complex, utilizing 4 of the 7 acres of garden space. 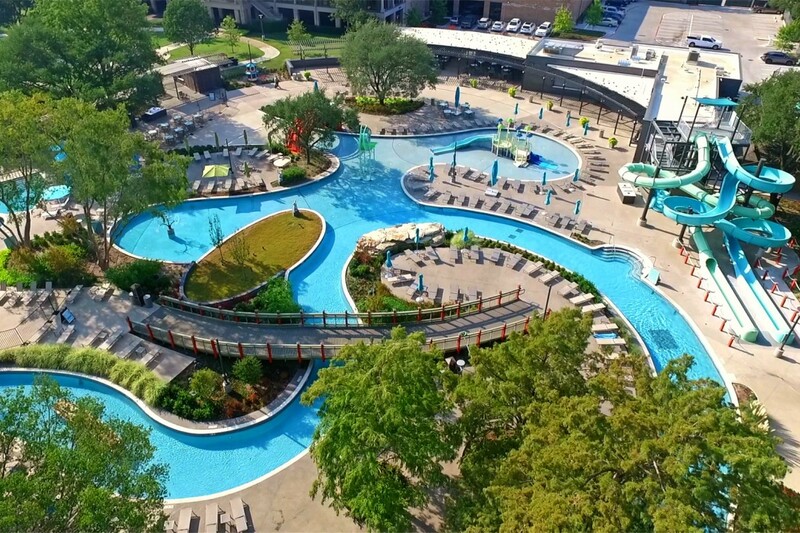 Jade Waters features a lazy river, two 180’ water slides, a children’s area and activity pool, leisure pool, swim-up bar and full-service restaurant. Cabanas and day beds are available in addition to the ample lounge seating. Jade Waters is exclusively for the use of hotel guests and health club members. General Contractors, T&G Constructors, contacted Bomanite Licensee, Texas Bomanite in the Design Development phase of the project to work with Landscape Architecture firm TBG’s design team to provide finish options and budgeting to T&G Constructors. The hardscape portion of the project contains 60,000 square feet. Texas Bomanite provided Sample Boards of concrete finishes to TBG prior to full-size mockups being constructed on-site. Two finishes from the Bomanite Exposed Aggregate Systems and three different colors were selected by TBG and Hilton from the jobsite mockups. The finishes were Bomanite Sandscape and Bomanite Sandscape Refined systems. The Bomanite Refined finish was also combined with a Bomanite Custom Imprint System to create a unique finish for the area of the project bounded by the Lazy River and referred to as the “Big Island”. This finish was also installed at the “Beach Entry” of the activity pool. The Imprint System combined with the Bomanite Sandscape finish simulates shifting sands on a beach. Following approval of the mockups, the construction phase began. Due to unusually wet weather and soil conditions, the project had fallen behind schedule. 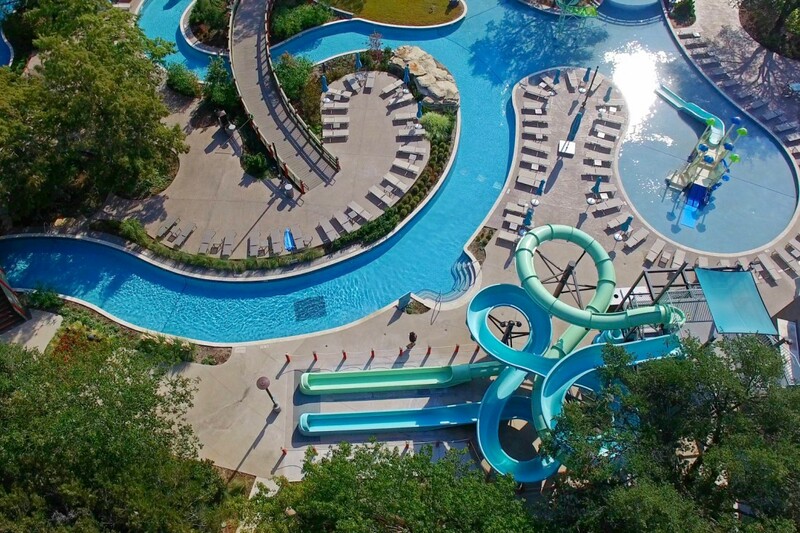 T&G Constructors required an accelerated schedule to maintain the July opening date for the waterpark. This required crews to work six and seven day workweeks as well as holidays for several weeks. The congested site and wet soils presented another obstacle and required daily meetings with T&G Constructors Superintendents and their subcontractors for coordination of work areas as well as laydown areas. Texas Bomanite used recycled concrete fines in place of cushion sand to provide a better base on which to set forms and pour the concrete. Recycled concrete was also used to provide haul routes to get materials and equipment in and out of the site. The waterpark and garden opened in July of 2016 as scheduled. The sustainable properties of Bomanite Sandscape Texture make it an excellent choice for environmentally conscious applications. Bomanite Sandscape Texture mix designs readily accept fly ash or slag or other supplementary cementitious materials, offsetting a portion of the ordinary portland cement. Urban heat island effect can be greatly reduced by thoughtfully designed installations. 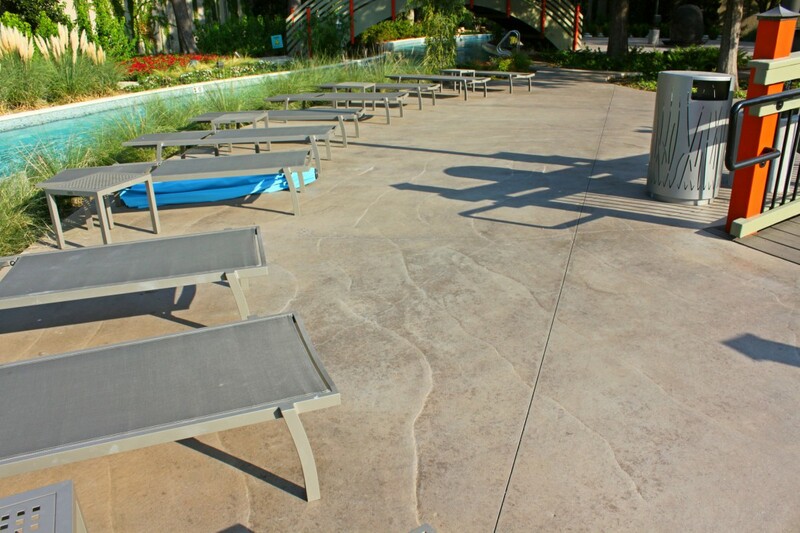 Third party independent testing has shown that Bomanite Sandscape Texture can exceed .29 solar reflectance without the use of white cement, allowing for the concrete to be cooler underfoot making it ideal for large urban plazas and pool deck applications.